As a running enthusiast, sports scientist and competitive runner, I have always been fascinated by East African running. 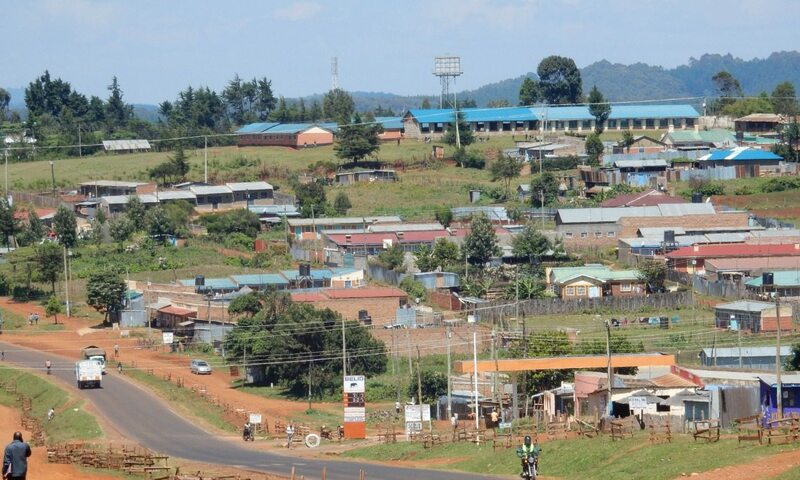 In particular, the small town of Iten, nestled at 2400 metres above sea level. In my university days, Professor Yannis Pitsiladis, known for his intense studies into East African running, would always encourage me to visit. Eventually I plucked up the courage to make the trip, and sure enough, it proved to be a place like no other. I decided that I would attempt to do my two training sessions the Kenyan way, which is one at 6am and the second at 10am. I climbed out from underneath my mosquito net and headed out at 6.30am. The sun was just starting to come up over the horizon at the far side of the Great Rift Valley. I set off alone and did a really good 60 minute fartlek session down one of Iten’s many red dusty roads. After a light breakfast of fruit and Kenyan cornflakes, I met up with some athletes – Jake, Cheggers, Julien and Luca – and went to the forest for my second run of the day. We met Asbel Kiprop at his forest house and Jake parked the car in his garden. It was my first trip to the forest and I had been warned about how hilly it is. It was a great run and as usual started off easy and ended up in a fast finish. The forest reminded me of Scotland with very similar types of trees, grass and trails. It was an absolutely stunning place to run. We ran for 55 minutes and at the end I was burst, although I was delighted with a double morning session with both being relatively tough runs in their own right. In the afternoon, a group of us went to the “Emirates” pool shed for a few games of pool, which is one of a very few things to do in Iten when you are not running. When I call it a shed I do literally mean it’s a shed with a single pool table in the middle and wooden benches around the inside of the walls. It’s hardly The Crucible, but with a few locals always hanging around to watch it has a great friendly atmosphere. At less than 20p a game it is a lot cheaper than back home. The inside walls of the pool shed are covered in posters of Chelsea and Arsenal. The locals here go mad for English Premier League football. After a busy day, I definitely needed a good dinner to refuel my body and the best place to eat in Iten is the Kerio View hotel. At KV, as it is known locally, you can get almost any type of food that you can get back home. They have different varieties of meat dishes with rice, potatoes, pasta, chapati… lots of chapati! Myself, Evan, Jake and Soufiane, an Italian athlete, piled our plates high with food that most restaurants back home would be proud of. Evan was in Iten on physio duties and kept himself busy most of the day by treating some of the athletes. We were joined once again at our table by legendary Italian running coach Renato Canova who tells countless stories about athletes, marathons and major events from all over the world. He is an interesting guy to listen to. I got up at the crack of dawn and went for an 8 mile run. After breakfast, me and Evan jumped on the back of a motorbike taxi and went down to the famous St Patrick’s High School to meet Brother Colm. 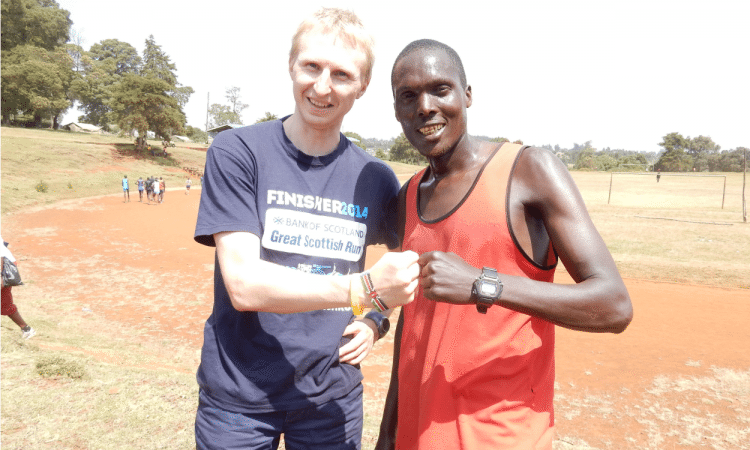 He trains a number of world class athletes such as David Rudisha and Augustine Choge (you can read more about the training philosophy of David Rudisha and coach Colm O’Connell in an AW feature here). His group of nine athletes were having an easy day. Their 10am run was an easy 10km and we followed in Brother Colm’s car, with Ian (coach) shouting instructions to the athletes from the front seat. Afterwards we chilled at the training house with the athletes and ate some Kenyan porridge. It is made by mixing millet powder to boiling water and tasted quite sweet. These Kenyan runners certainly like their sugar. In the afternoon I saw an estate car pull up at the side of the road with something black and white in the boot. The driver got out of the car and opened the boot. Out climbed a full-size adult cow. Surely I have seen it all now. A few days ago I saw a motorbike with a three-piece suit tied on to it, casually motoring along the main road. The most people I have seen on a motorbike is five, but I imagine that this is nowhere near the record! My old running shoes were getting into a bad state of repair and I was considering throwing them in the bin when I thought of Kemboi, a Kenyan runner who is about the same age as me and clearly very poor, who had previously told me that he would gratefully accept anything that I could spare. I decided to put a little package together for him. It consisted of running shoes, an old t-shirt and a bar of soap. He seemed to appreciate the soap more than anything else. In the late afternoon, Jake invited a number of people round to his house to shoot some basketball hoops. He also made us some dinner and I was surprised at how good a cook he was. Pasta and Bolognese washed down with beetroot and mango juice. That was us refuelled and ready for tomorrow’s training session. While I was in Iten I stayed in three different locations for almost a two-month period in total. The first was a local Kenyan-style house inside a compound. There were other athletes, of various nationalities, living within the compound who were all great company and made me feel so welcome. Then I moved on to Elgon Valley Resort for a couple of weeks which reminded me of an eighties-style British holiday camp.